Food Costs > How Much Does a Costco Sheet Cake Cost? How Much Does a Costco Sheet Cake Cost? Costco cakes are fairly large but can be purchased for about the same price as a smaller cake in a traditional grocery store. On average, a Costco half sheet cake will cost $19. This is the price regardless of how you customize it at a local Costco store. According to this blog post on He and She Eat Clean, she tells us how to order a cake from Costco and mentions it will cost $18.99 and also includes what an order form looks like. The half-sheet cake is roughly 12 by 16 inches in size and offers approximately 48 servings on the basis of two by two-inch cuts. To order a Costco cake, you will need to fill out a form and return it to a Costco location you want to pick it up at. When ordering, you will have two flavoring options when using the customized order checklist: either white cake, which is filled with two pounds of vanilla cheesecake mousse and iced white buttercream or chocolate cake, which is filled with two pounds of chocolate cheesecake mousse and iced chocolate buttercream. As for decorations, you will be able to choose one decoration from the following designs: balloons, smiling sun, rainbow, clown, princess clown, dinosaur, caterpillar, music, over-the-hill, beach, American flag, carriage, cross, graduation, roses, bouquet, lattice heart, scored rosebuds, chocolate bouquet, baseball, basketball, football, golf, hockey, tennis, soccer or a skateboard. If it’s for a graduation cake, then you will be able to note the school colors. Inside of the store, they will have a book and/or board on hand that shows you what each design can look like on the cake before you order. Lastly, you can add a small message if you want. The ordering process is quite simple since the bakery only needs at least 24 hours of lead time. 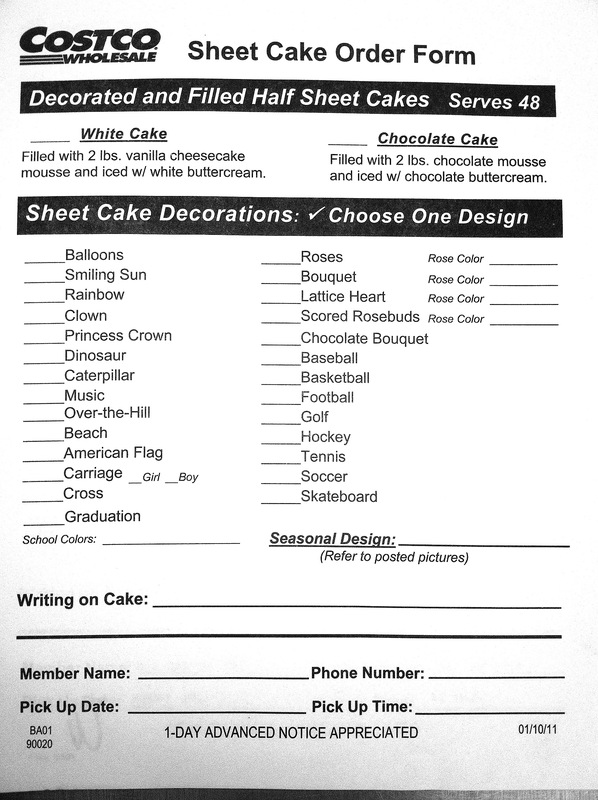 The order sheet simply has you put a check mark next to the type of cake, frosting, design and will then have you will fill out a line with your desired message. All of this can be done inside of the bakery near the cakes. Do not forget that you will need a Costco membership to buy a cake. You must include your membership number on the order sheet. If the bakery is open, they will be more than happy to write a message on a pre-made cake for no charge. This is a great option for those who need a cake at the last minute. There are a few negative things about ordering a cake from Costco. First, there are very few designs from which you can choose compared to other stores and bakeries. Also, Costco will not often accommodate “special orders” and will only make the cake the way it is pictured. However, most people find that the lower price is well worth losing these extra options. 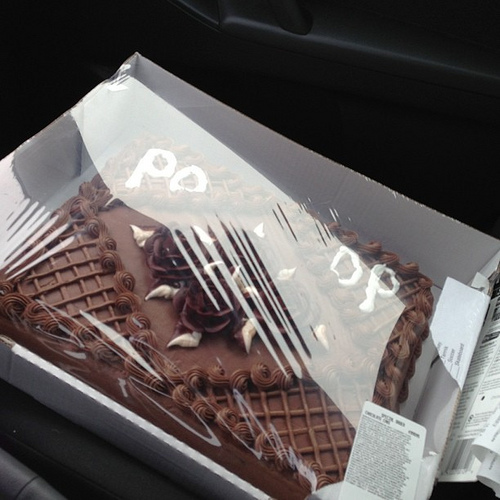 One of the best ways to overcome the previously mentioned difficulties is to purchase a plain cake from Costco. You can then purchase decorating supplies and make any design you want. This will still get you a high-quality, delicious cake but with the decorations of your choice. Aside from the decoration options mentioned above, Costco will offer seasonal options during the fall, winter and spring months. If you want to save time, download this Costco cake order form before going to a local location. You can save money by making your orders online without having to make that special journey to Costco. Simply download the form from the website and fax it to your local location. However, some customers say some locations won’t accept a fax order, so it’s best to call ahead of time to know for certain.